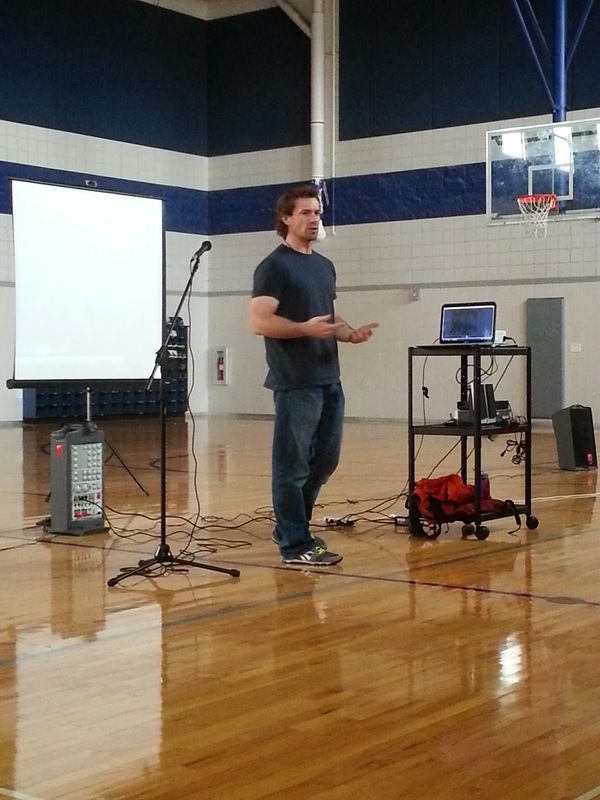 Boone Smith, a wildlife zoologist and known as “a capture guy” from Preston, Idaho, recently spoke to the Logan River Academy student body. He travels the world trapping and putting collars on wild big cats, such as mountain lions, pumas, cheetah, jaguars, and snow leopards. Being a wildlife zoologist was a natural choice for him. His great grandfather was a government tracker for bears, and his grandfather was a mountain lion bounty hunter who taught Smith how to train hound dogs and sets traps. From there, he attended USU and BYU. His first job was as a wildlife field biologist tracking a group of animals with radio collars. The way he would catch a mountain lion is first by finding a track. Then, the hound dogs are turned loose to find and trap the lion. In the past, they gave the lions a sedative, but now they give them a disassociative drug, which makes the lion hallucinate and lose the use of his senses, while maintaining muscle control. While the animal is under the influence of the drug, they put a radio collar on the animal, and they monitor the lion’s heart rate, pulse, and temperature, as well as check for diseases, measure their paws and teeth, and determine age among other things. They want to take advantage of the time to gather as much research data as possible. In order to hunt and collar the animals, Smith said the capture guys needed to go where the big cats are. Some places don’t work for the dogs, so instead they use snares (buried wire that pulls tight and traps the cat when stepped in). As with many of the things they do, there is a lot of trial and error learning. The capture guys use trail cameras to figure out where the animals will step. In one situation they learned that the animals traveled on the roads. A trick they learned was to put a log near the trap. This helped them avoid catching a lazy water buffalo that would stay away from the log; the jaguar, however, did not see the log as a deterrent, and they were able to trap it. The capture guys also needed to learn how to utilize snares in various landscapes, such as rocky terrain. The radio collars don’t bother the animals or interfere with their habits. The collars are used to see what animals do in private or in remote, isolated, and forested area; know their movements, such as rest or moving, speed; and whether they are with other animals or alone. As a result, zoologists are able to learn how the big cats survive alone and in a group, what their territory is, how same and different species interact with one another, what may be killing a species, how habitats and terrains affect species, etc. Why does the Capture Guy do it? Smith stated that we have a responsibility to take care of our wildlife and the information can be used to make management decisions. The wild animals need wildlife areas that are big enough for them to live and survive. Smith also does it for the adventure, excitement, and the thrill of the hunt. The students were able to sense the excitement as they asked questions to learn more about the animals and his experiences. It was an enjoyable time and Logan River Academy appreciates the time Boone Smith took from his schedule to spend time with us. Students, faculty, and anyone interested in learning more can go to the following websites.